"Tired of plain old boring water? Here's a cool and fruity twist on it! Mix up your fruits for a tasty surprise! Citrus fruit and berries work best. If you want more flavor, add more fruits, and if you want less flavor, use less fruit. You can squeeze the juice out to color the water or just put whole slices and berries in." Pour water into a pitcher. Add ice and strawberries. Squeeze lime slices to release some of their juice into the water before adding them in. Stir to combine flavors. Summer refreshment is bright with fruit and flavor! 4-15-16: I drink infused water all the time and often do this combo. Sometimes I use sparkling water and add mint....very refreshing! Cool and refreshing!! I'll be making this throughout the summer. 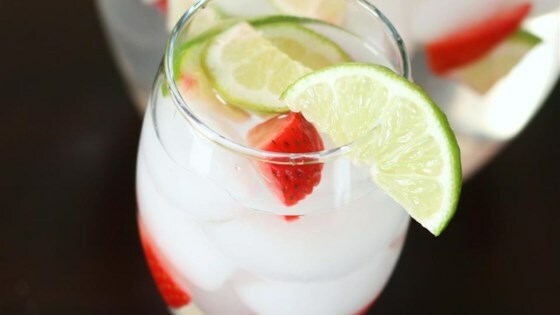 The strawberry lime combo is a great way to spruce up a glass of water! I really love the flavor. It's makes drinking water a whole lot more enjoyable! Thanks!! Excellent combination of flavors. This is a great way to get your kids to drink water! Thank you for the recipe. So refreshing!!!... I think I'll make this infusion more often, my oldest daughter is drinking a lot and she hates water. Strawberry and lime work perfectly together. I love love love fruit infused water! Simple. Delicious. Refreshing. Great with lemon, too!